At Madden Bowl XVIII, EA Sports' Anthony Stevenson just announced that the cover athlete for Madden NFL will be voted on by fans for a second year. This year's field will be doubled to 64 candidates, and the first round of voting will be a "play-in" round pitting NFL teammates against each other to determine their franchise's representative in the second round through to the finals. After 13 million votes were cast in last year's cover competition for Madden, EA Sports was widely expected to return to this format to determine the game's next cover star. The doubling of the field presents even greater opportunity for an unorthodox selection, as Cleveland Browns running back Peyton Hillis was for the Madden NFL 12 cover last year. The full field of candidates was not announced. It will be on March 7, when voting commences online. It can be assumed that many stars from last year's tournament will be among those vying for this year's honor. One such player, Denver Broncos quarterback Tim Tebow, appeared on behalf of EA Sports this morning on several radio programs broadcasting live from Indianapolis. Tebow also was a guest last night on NBC's Late Night with Jimmy Fallon. Tebow was also the cover star for EA Sports' NCAA Football 11. If he's in the field, he would have to be considered the 1:1 favorite to win the whole thing. That's partly because quarterbacks like Tom Brady, Eli Manning and Peyton Manning have had no association with the title and are considered to be too expensive for the endorsement,. Green Bay's Aaron Rodgers was part of last year's 32-player field, losing partly because of superstitious Packer fans wanting to spare their quarterback from the infamous "Madden Curse." Rodgers may yet be a candidate this year, but after a Super Bowl MVP season, he may also have priced himself out of a cover. According to an EA Sports press release, other stars attending Madden Bowl XVIII today include past cover subjects Drew Brees (quarterback, New Orleans) and Larry Fitzgerald (wide receiver, Arizona). Arian Foster (running back, Houston), Antonio Gates (tight end, San Diego), Jimmy Graham (tight end, New Orleans), DeSean Jackson (wide receiver, Philadelphia), Von Miller (linebacker, Denver), DeMarcus Ware (linebacker, Dallas), Patrick Willis (linebacker, San Francisco) and Matt Forte (running back, Chicago) also were listed, meaning any of these are likely candidates for the field of 64. Last year, Hillis prevailed after four weeks of voting in a joint promotion with ESPN and its afternoon SportsNation program. 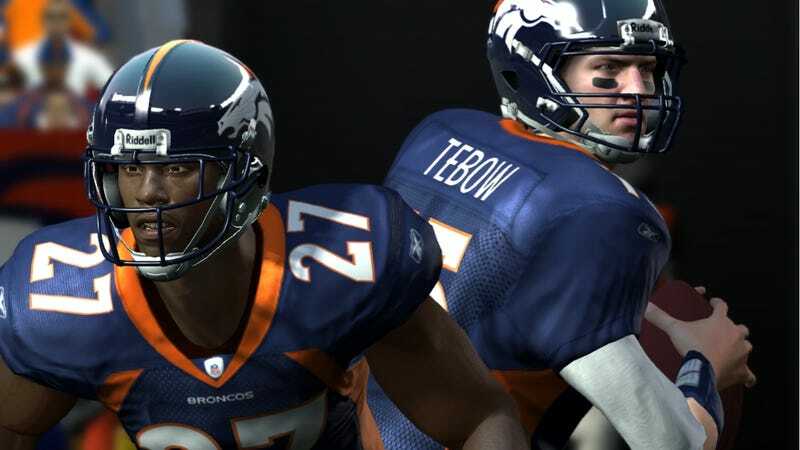 The promotion's success helped make cover voting a model for other EA Sports titles, including NCAA Football 12 and this year's Tiger Woods PGA Tour 13.